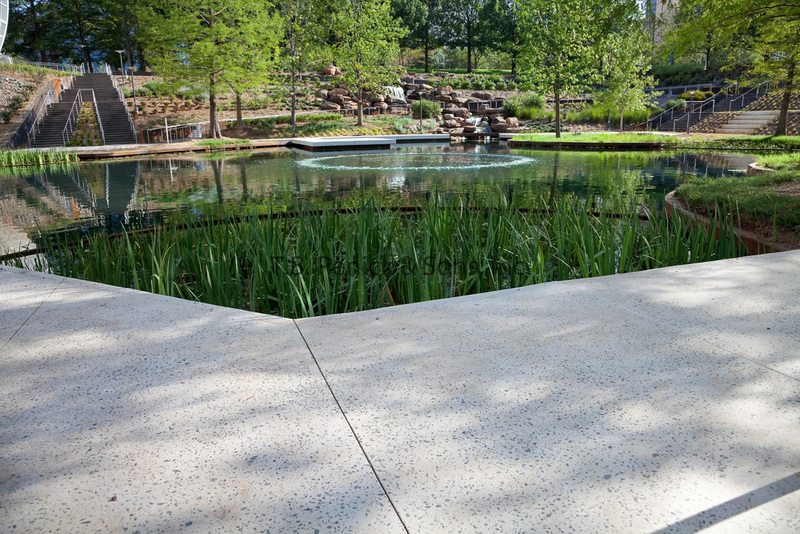 The 15-acre Myriad Botanical Gardens is an integral component in the downtown fabric of Oklahoma City. The City of Oklahoma City hired the Office of James Burnett to develop a design that improves pedestrian circulation, increases visibility and provides public spaces for programmed activity. The berms and retaining walls surrounding the park were removed to create visual connectivity with surrounding streets and make it more accessible to the community. New features of the park include a grand lawn, concert stage, extensive walkways, children’s play area, a dog park, plaza, and ice skating rink. T.B. 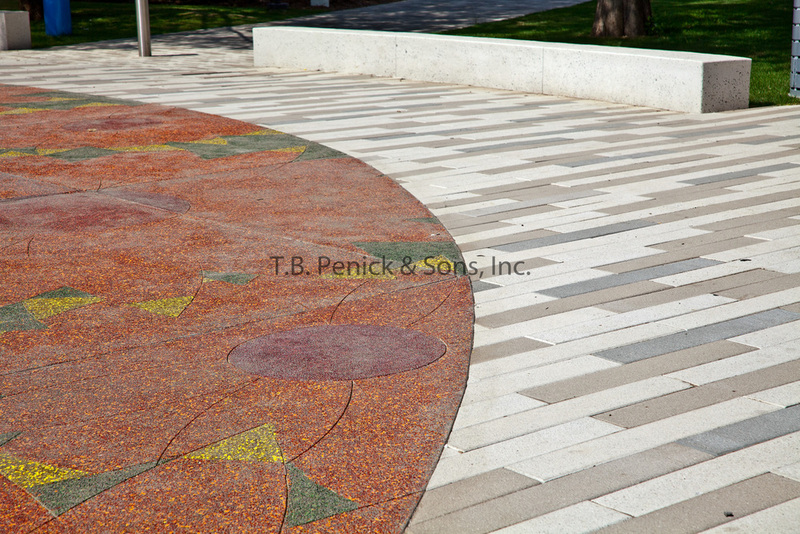 Penick worked with OJB to select project specific finishes. Samples were created to establish the design intent. The materials ranged from local materials, white cement, black granite, carbide and various shades of glass. Executing the design in the field was challenging but rewarding. Penick’s scope of work was completed between November to April, during the harsh winter months of Oklahoma. The local red sand posed an issue with the white color selected for the majority of the flatwork. 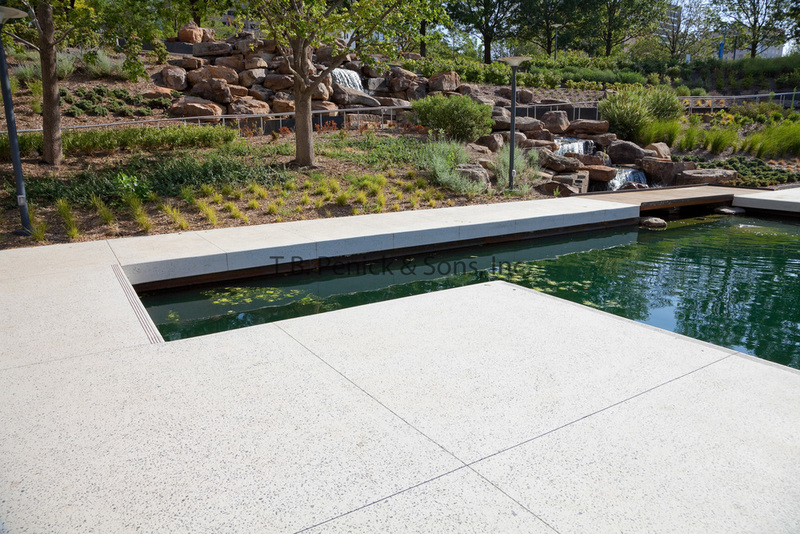 Penick worked with local suppliers and was able to match the pre-selected white exposed Azzuro finish featured around the pond, the floating pedestals, the terraces, sidewalks and ice rink. Sloped, radius, and cantilevered seat walls were also poured in the white concrete. Forms were stripped the same day to finish. The seasonal plaza also features the white exposed finish. The area serves as a water feature in warmer months and as an ice rink in the winter. Black Lithocrete® granite and Carbide Presto Pneumatic Spray® finish walkways and ramps lead you from one side of the park to the other. 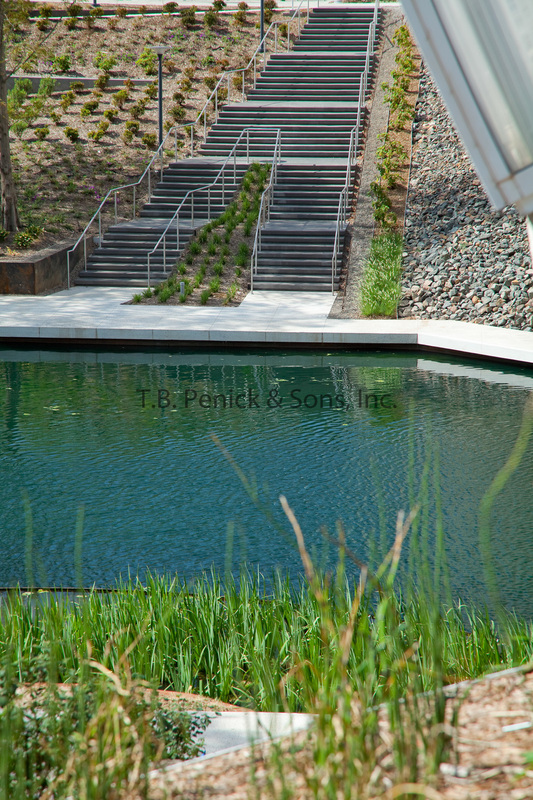 Four sets of tall Carbide Presto Pneumatic Spray® stairs bring you from the sidewalks down to the pond. Runnels were also poured and stripped same day to finish them with matching carbide. Both the dark and light finishes create a subdued complement to the plantings selected for the park. 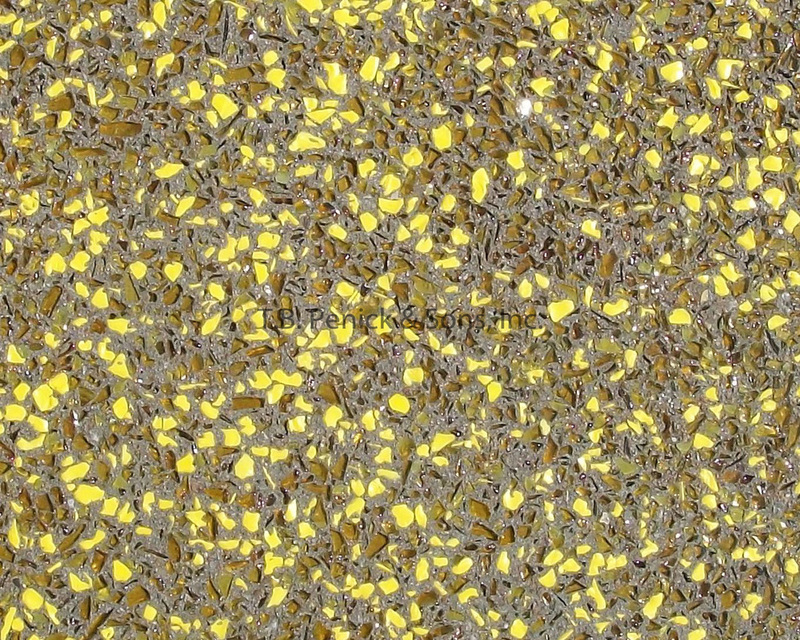 Conversely, the children’s play area boasts vibrant colors achieved with the use of seeded glass. 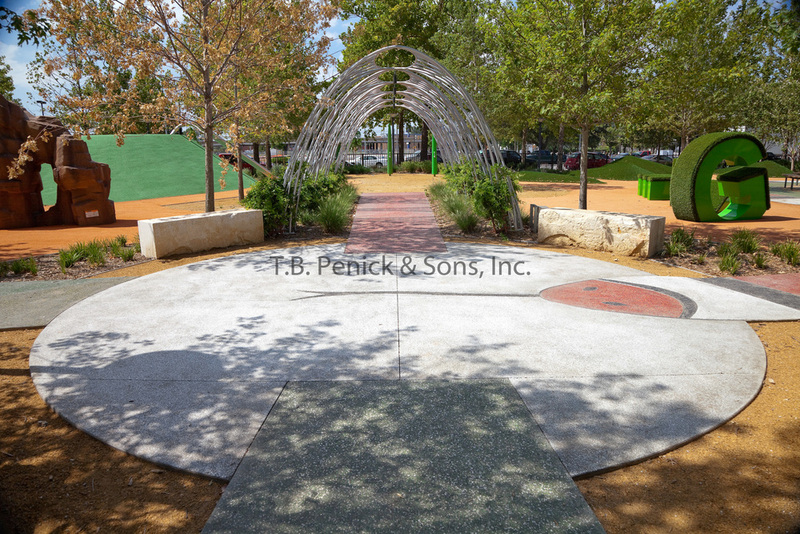 Green vines and a red, black and white Lithocrete® snake formed with stainless steel create walkways through the play zone. 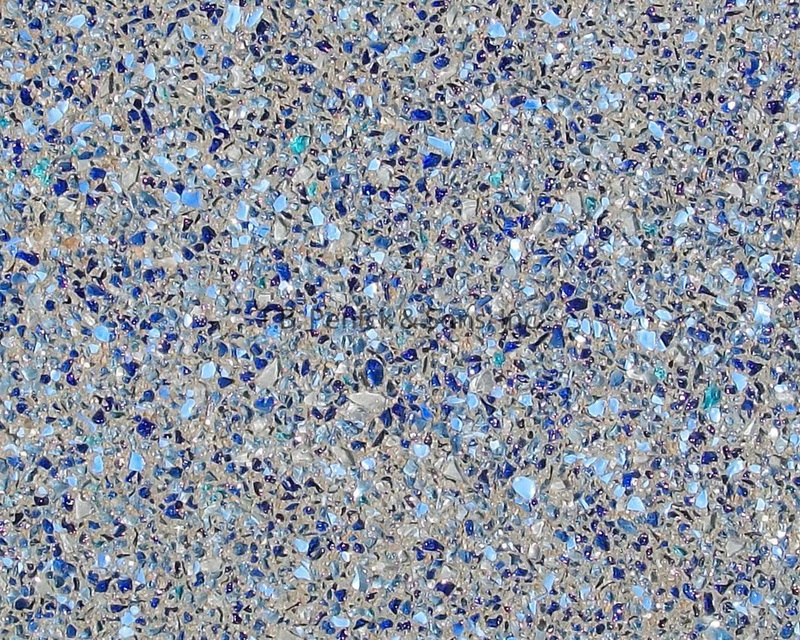 The most popular attraction is the new glass Lithocrete® splash pad. The intricate flower design required extensive planning and layout to ensure perfect execution of the design intent. Good solutions were presented in the field. There are over 200 intrusions through the concrete due the various heads and lighting within this area. Each flower panel was poured separately. Templates were used to seed the various colors of glass within each flower. The interactive water feature is inspired by Oklahoma thunderstorms and mimics the changing weather. After a thunderclap rain falls, it pours, when the rain stops, the mist lingers for a while before the whole thing starts over.